We are honored to have been invited to participate in this important and historical event and to give a voice to the South Korean dogs in the meat trade. 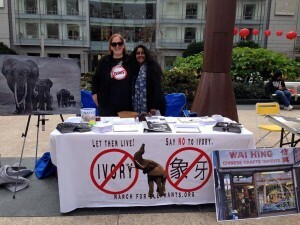 We had a table to collect petition signatures and hand out our leaflets to visitors and supporters. 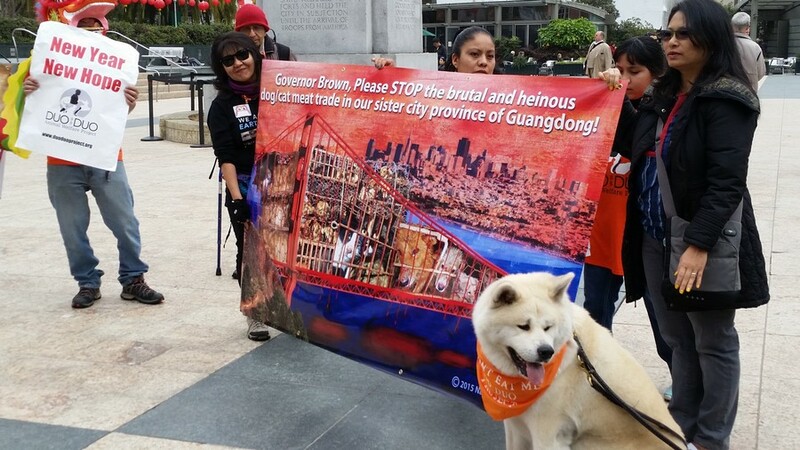 We collected 54 signatures and had ten people sign our letters to the United Nations Secretary General Ban Ki-Moon at the event. 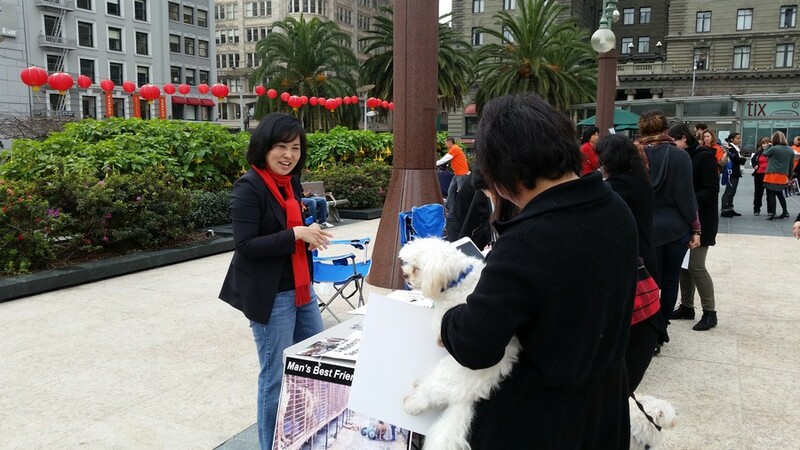 A couple of supporters also made donations to us in the amount total of $110. Thank you very much! We will send these donated funds to Korean activist/rescuers to be used for their campaign. I was one of the seven speakers at this event and this was my first speech ever but I think it went well. Click HERE to see professional photographs from the event courtesy of Daniel McPartlan Photography! 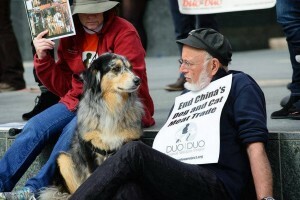 Click HERE to Take Action: Contact Gov. 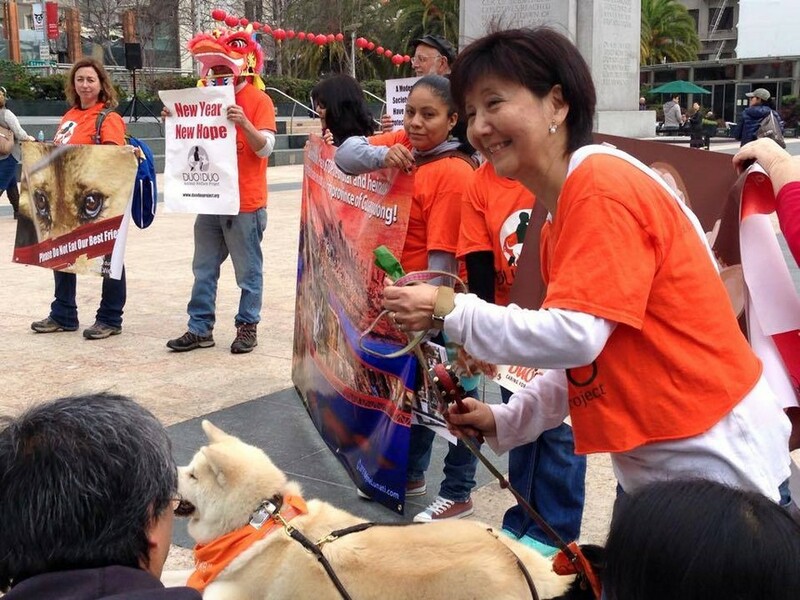 Jerry Brown to Help Stop the Dog and Cat Meat Trade in China! 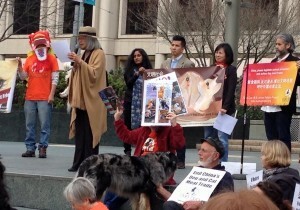 Andrea Gung, Founder of Duo Duo Animal Welfare Project welcoming everyone to the rally. 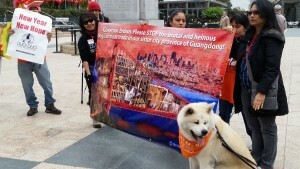 Andrea, Ambassador dog Komi and the supporters featuring Event poster. 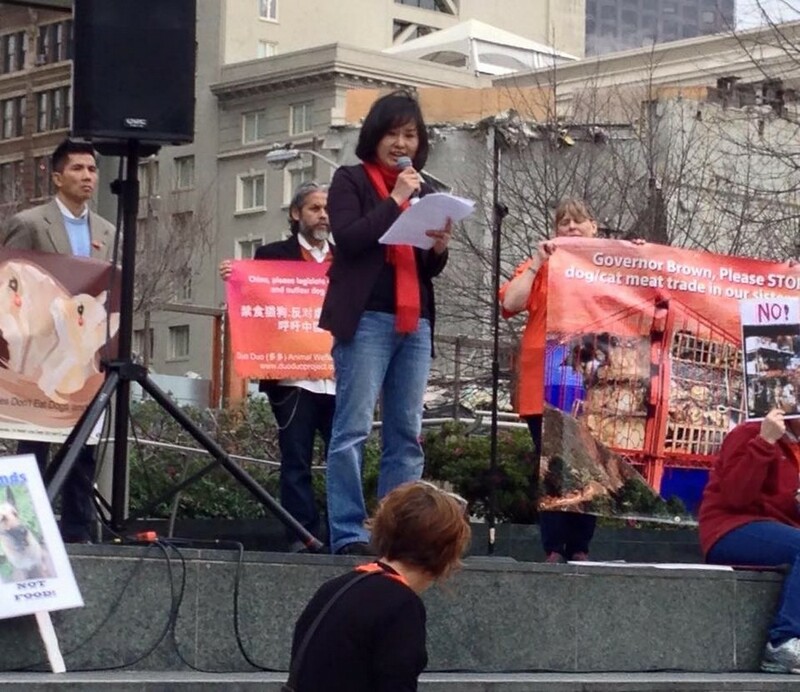 Andrea Gung talked about how we can all help to end the horrific dog meat cruelty in China. 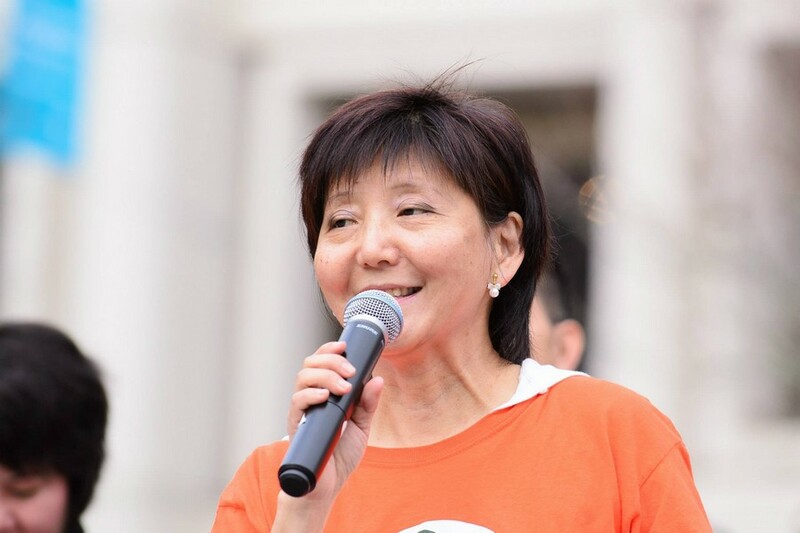 Vicky Lynn, President, Asians for Humans, Animals, and Nature (AHAN) talked about how they were able to help Taiwan establish Animal Welfare Protection Law in 1999. 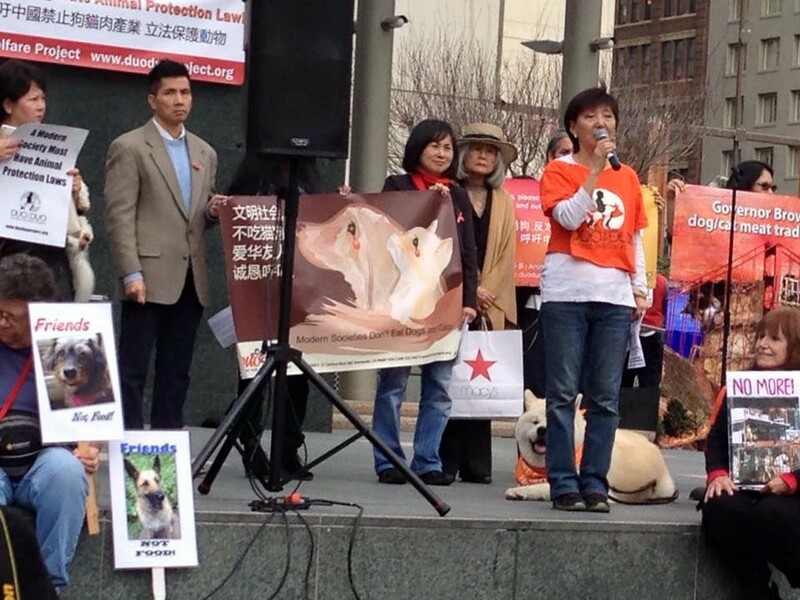 Taiwan has one of the best Animal Welfare Law in Asia today! 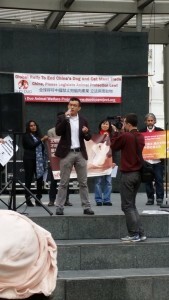 Wayne Hsiung, Founder, Direction Action Everywhere (DxE). From his Chinese American background talked about why this is not just a Chinese problem, our own dog abuse, abandonment, puppy mill, and farm animal cruelty problems. 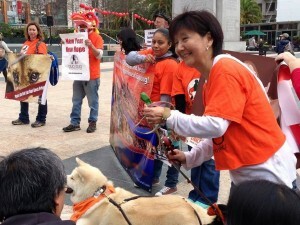 Giny Woo, Koreandogs.org talks about her campaign to end the South Korean dog and cat meat cruelty. 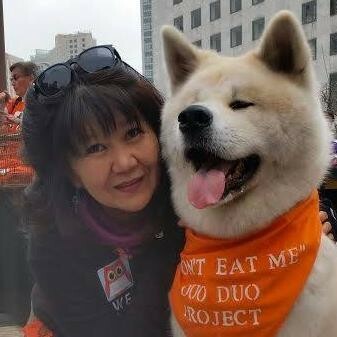 Karen and Ambassador dog, Komi for cute photo op. :O) Thank you! 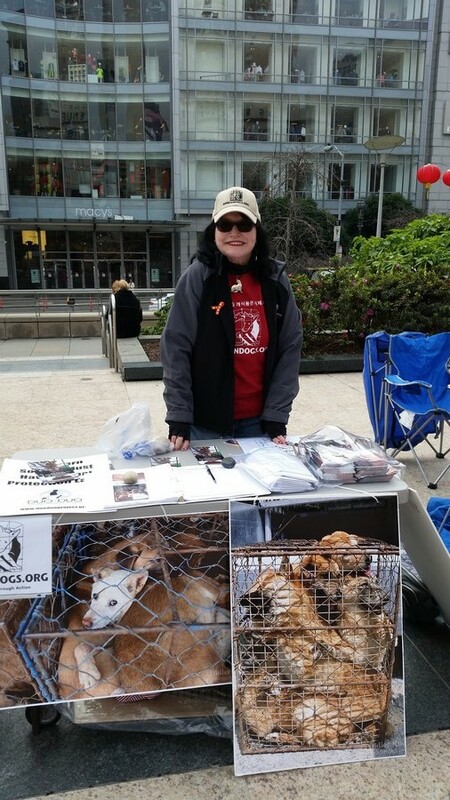 Our table. Giny talking to a supporter with her furry baby. 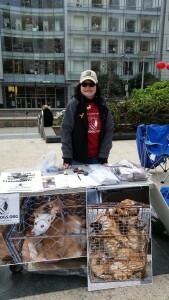 Our super volunteer activist, Sammarye helping the Korean dogs as usual. Thank you, Sam! You the best! 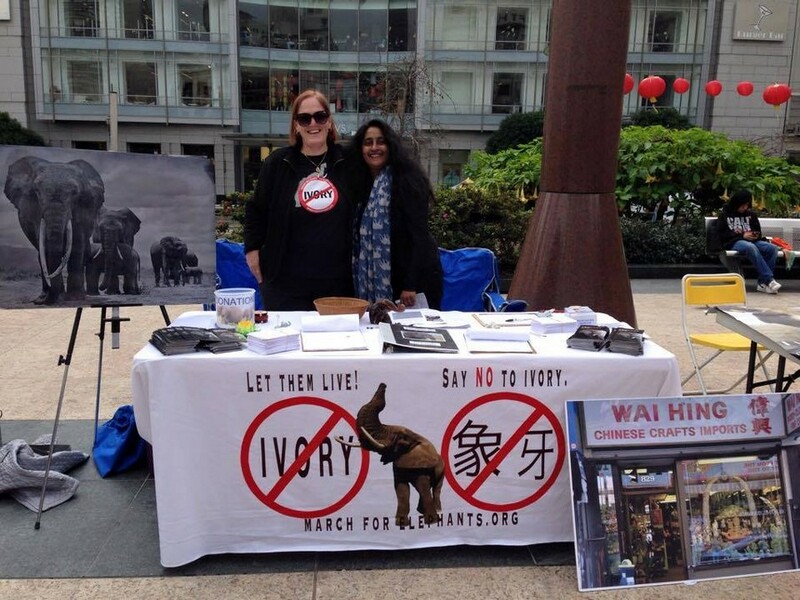 Rosemary and the Global March for Elephants and Rhinos team were also there to represent the elephants and rhinos killed in ivory trade.